A study of Elena’s art uncovers the psychological as we look into the range of her work. One can see her search into the inner depths of life forces driving us forward, and the dreams and motivations in the human psyche. Elena’s “Street People” series in bronze sculpture, as well as in the charcoal drawings, water color and pastel paintings capture undercurrents of big city life, to represent resilience and the human need for survival. Her “Mother and Child” series in bronze sculpture explore the eternal bond of first love as a mother’s gift to her child; expressions of the child in needing, and response of a mother’s devotion. Elena’s life size bronze sculpture, “The Good Spirit in the World As Woman” symbolizes the artist’s intention of woman as a primary power, an idealized version of what every woman should be, as a goddess of compassion and understanding. Elena’s “Malibu”, “Northern California” and “New England” landscapes and seascapes in oil painting and water color center on the awesome beauty, and relevance of forces in nature beyond our control. Her oil paintings of brilliant flowers and the miracle of perfection in rainbow colored blossoms at the peak of glory, speak of fragility and impermanence. Elena’s silk-screened Olympic poster “Freedom through Sports and Science”, for The California Science Center, celebrating Olympic athletes. These posters were purchased at the Museum by world-wide visitors during the 1984 Olympics. The life-size bronze sculpture “Nucleus of the Social Spirit, Mother and Child” for the Child Help USA Foundation, commemorates the Foundation’s decades of work with abused children and remains in the lobby of the Child Help USA headquarters in Los Angeles. Elena’s bronze sculpture “Life Spirit” for the Santa Marta Hospital Foundation, honors dedicated workers in the Foundation’s medical program, presented at their annual dinner honoring the philanthropist of the year having dedicated time and treasure to the hospital. The bronze sculpture “Spirit of Understanding” for the International Committee of the Los Angeles Philharmonic, as a tribute to the cooperation between the United States and Canada. This original bronze sculpture remains in perpetuity in the Canadian Consulate in Los Angeles. 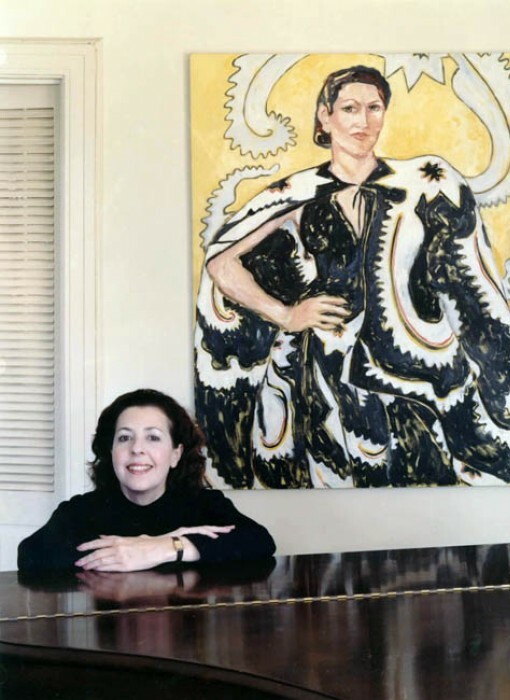 Elena Irving was born in Queens, New York, and at an early age exhibited her love of sculpture, painting and poetry. A graduate of New York University and of the New York Fashion Institute, Elena became a fashion designer on Seventh Avenue. She also continued her work in sculpture and studied painting and portraiture with master painter Mabel K. Hatt, who was compared to John Singer Sargent. Elena married, and later with her husband, screenwriter Robert Irving and their two sons settled into a home in Mexico, where Robert Irving received a professorship to create a school of Communication at Iberoamericana University in Mexico City. The peasantry in Mexico touched Elena deeply, and her time there began an intense period of work in sculpture, oil painting, water color, drawing and pastel. Galleries in Mexico City sold her art in Latin America and Europe. She exhibited at the Museum de Arts Contemporaneo in Monterey, The National Museum de Bellas Artes and the Museum of Modern Art in Mexico City. At that time the President of Illinois State University Dr. David K. Berlo, appointed Elena as the American Representative in Mexico for the “International Collection of Art”, sponsored by the U.S. State Department. She was subsequently appointed as Acquisitions Director for the Ewing Museum of Nations to collect art of young people for psychological study at the Museum. Nine years later, Elena and her family returned to their native U.S. She established her art studio in downtown Los Angeles, and continued exhibiting her painting and sculpture. As a member of the Greater Los Angeles Press Club, Elena wrote art critique and as a columnist, exploring themes of commerce and life style. Elena is a published poet, and a judge in art competitions for paintings, sculpture, graphics and photography.